on the tiny Tonto Apache Reservation in Payson, Arizona. In the early morning hours of December 23rd, 2016, something truly amazing and unexplainable happened on the tiny Tonto Apache Reservation in Payson, AZ. Just as he does every morning, Joseph “JJ” DeCola, an 83-year-old disabled Korean War Veteran, rose early to start another busy day. As he went out the front door, JJ noticed that the family of elk that come up for morning visits were busy feeding in the front yard. 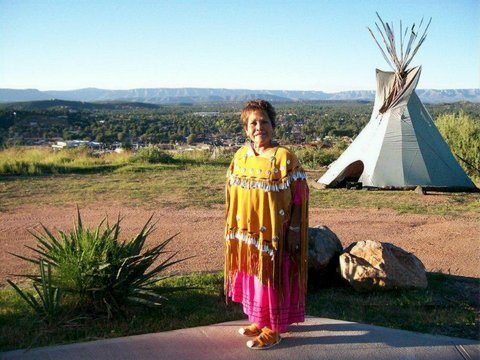 JJ’s wife Jeri, one of just a few full blooded Tonto Apaches, was just getting up to start her day as the tribe’s Chairperson. As JJ glanced at his front yard, with a stunning view of downtown Payson and the majestic Mogollon Rim, there she was. A 300 lb. 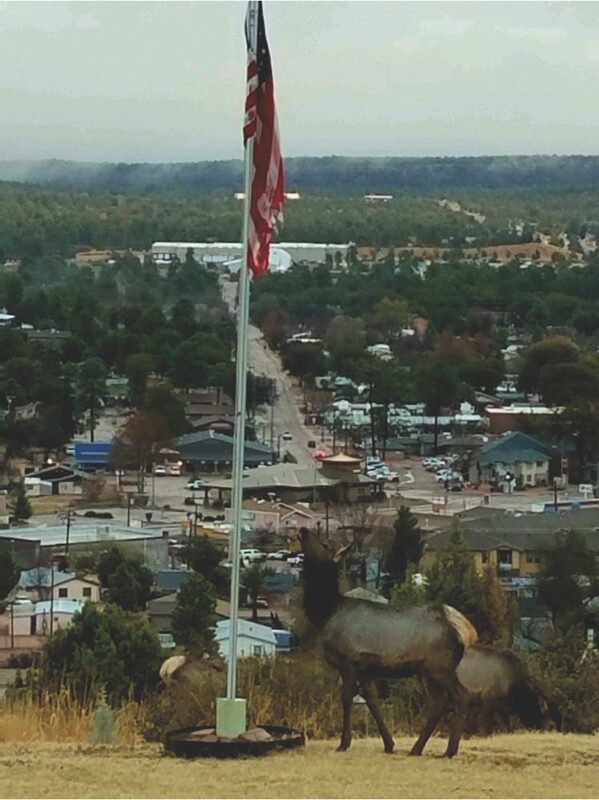 female elk was standing next to their flagpole, staring straight up, and absolutely transfixed on the American Flag! It took a moment for Jeri to fully understand what was happening. An Elk was doing what? And she had to get a picture of it? “Hurry Jeri, please!” JJ called out from the kitchen. Jeri found her phone, put on her coat and shoes, and rushed past an impatient 83-year old man now holding the front door open. This is where that something “truly amazing and unexplainable” happened. That elk had not moved an inch and there was an unmistakable high pitched cry in the air. “Jeri, she’s still there just like I left her only her mouth is open now”, JJ excitedly whispered. Carefully raising her phone, Jeri captured the moment without even checking her settings. The picture turned out perfect. Then, they just stood there, taking it all in. Neither one of them can exactly remember how long it was until the elk stopped mewing, slowly dropped her head, gave them a seemingly “thankful” look, and then joined to graze with the rest of the herd. And the rest as they say folks, is history. What that one mama elk inspired has, in turn, inspired a national “Patriotic Elk” movement that is beyond words. In August 2017, the original photo was sent to one of the top T Shirt Design Companies in the country. What came back was stunning and, as you will see, perfectly captured an amazing and miraculous moment. Thank you for visiting our “Patriotic Elk”. We know you will fall in love with her just like we have! Bring your Patriotic Elk home today and help support our brave veterans and conservation organizations who do such amazing work.